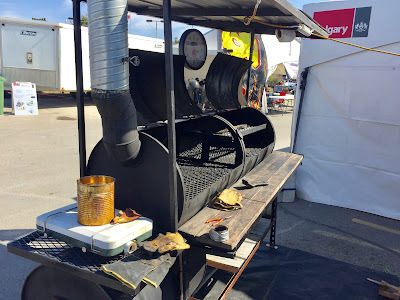 We are told that people can't find the tools they need to become prize-winning BBQ pitmasters. That is why we did an in-depth investigation into the phenomenon of custom BBQ design and constructions at this year's 25th annual KCBS BBQ competition, hosted by Alberta's (possibly, even Canada's) oldest BBQ Society. 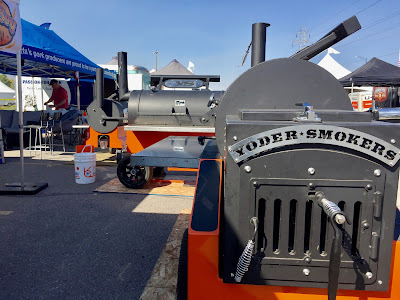 BBQ on the Bow is an annually occurring Kansas City BBQ Society (KCBS) sanctioned BBQ Competition and outdoor festival. It takes place at the Montgomery Community Association (Shouldice Park) during Labour Day long weekend. 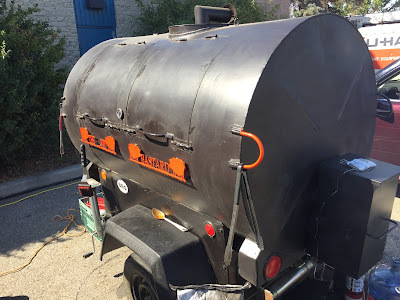 Their mission is to spread the love, passion, and joy for “southern style” BBQ while simultaneously celebrating and promoting local products, businesses, and musicians. Now you know why the Two Cowboys took an interest. They had us already at BBQ. We also share a similar passion for products, the people that make them and the people that sing about them. The association was founded in 1993 which, according to Bernie Kenney (VP of the Association) makes it one of the first of its kind in Canada. 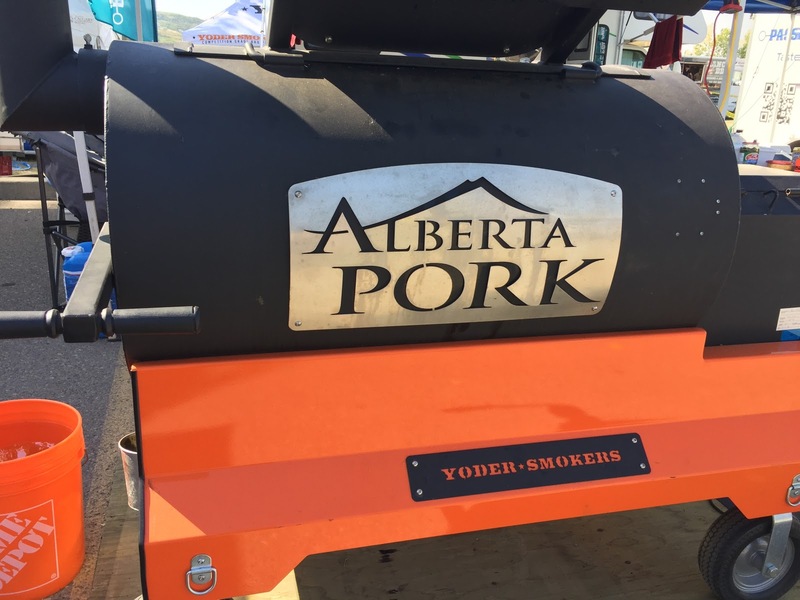 The BBQ on the Bow was created to jointly promote “Southern BBQ” and Alberta agricultural products of pork, beef, and chicken. This year it celebrated its 25th year. The event has endured everything mother nature threw at it over the years, be it floods, snow, winds and other storms. It has evolved from a small competition with a handful of teams to one of Canada’s premier competitions with over 35 teams competing annually. Forty-five teams competed this year, in spite of a Province wide fire ban, which makes it an event for the record books. It may also be because of the fire ban that so many teams grabbed the opportunity to do some BBQing in a controlled and permissible environment before BBQ withdrawal sets in. 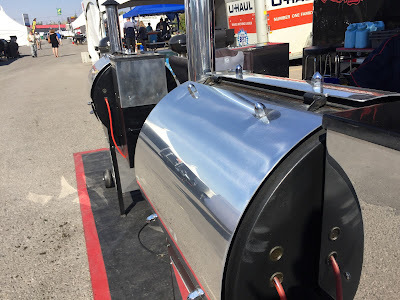 We are amazed at every competition to see the number of home-grown, self-built BBQ's that make it to competition. The people that take the plunge into constructing a custom smoker machine are seasoned pitmasters or very adventurous engineers. 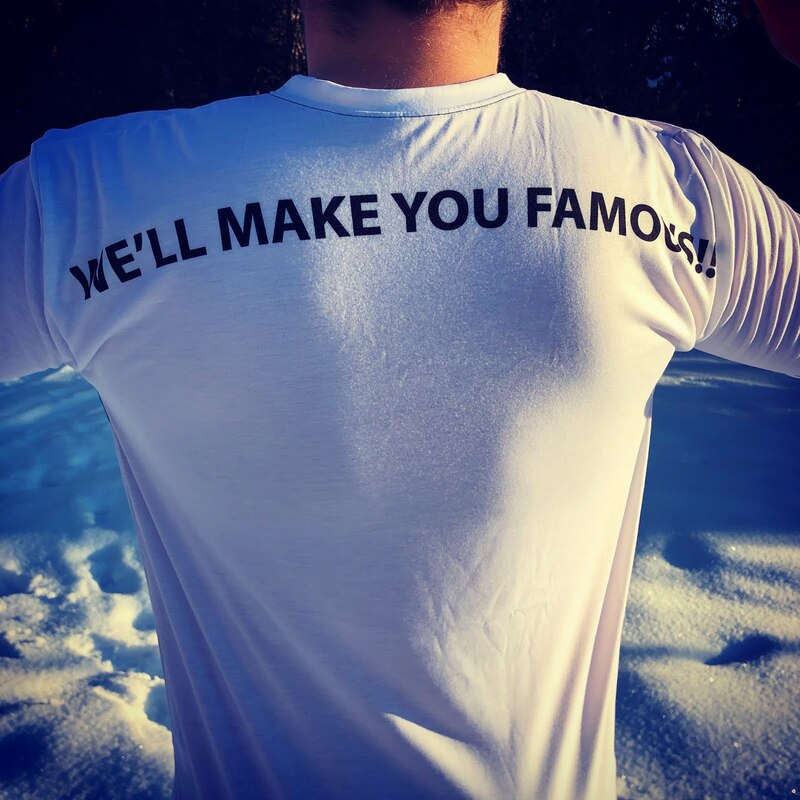 Big brand name smokers, which are usually in ample supply in such a competition, are often associated with newbies or with teams that managed to get that all elusive sponsorship from a well-known brand or manufacturer. 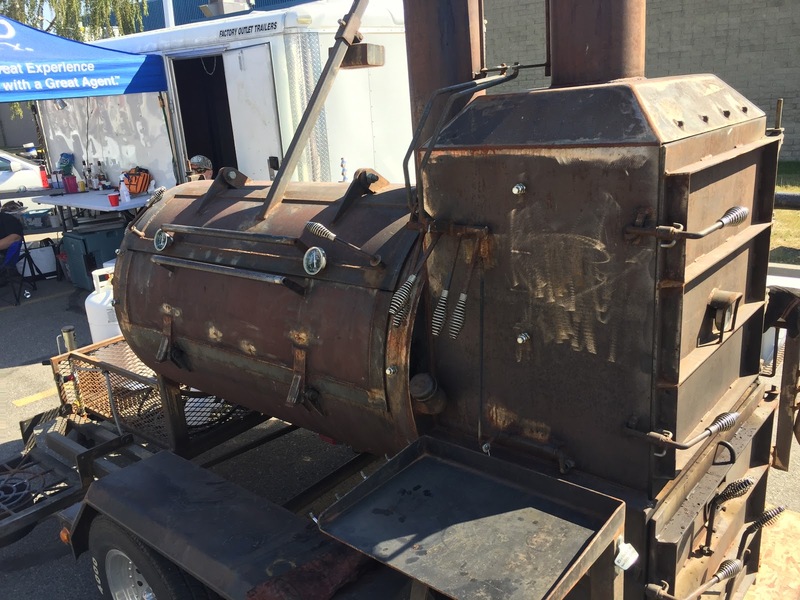 We've heard that some teams are even bribed into merely displaying a big brand name smoker (not necessarily cooking with it) for a small fee. You know who they are because the smokers are all clean, shimmering in the sun and brand new. The more salted pitmasters have their go-to smokers customized and seasoned over time to meet their particular need or style of cooking. We are told that these smokers have personality. "She's like a woman. If you treat her well, with respect, she will make a BBQ champion of you", a pitmaster proclaimed, which will remain nameless. One way you know that custom machines are worth their weight in smoke and iron is that they are the tools that show years of wear and tear. These smokers worked and will continue to do so. The meat-fat, grease, and caked on carbon from weeks, months and years of use serve as one-of-kind seasoning that provides a unique and unduplicatable taste to the fare. That is why these smokers end up with names and their teams with the medals. What makes a BBQ Smoker, good? If you listen to the champions, some like even heat in the cooker. Others want different temperature profiles on the same machine so that the machine becomes multi-purpose. Some smokers are suited to the purists that cook and smoke with wood. Others are "cheaters" with computer controlled pellet feeders and convection fans. One fact above all distinguishes a champion pitmaster and his team. It doesn't matter what tools they use. The machine helps, but it is their experience and finely tuned palate that separates them from the rest. They are also the ones busy cooking while the rest are looking. We earn our livelihood from producing great content and supporting inspiring people, businesses, and communities. We use Patreon to help us earn from our work. Please become a patron at http://www.travelingcowboys.com if you want to see more of this and other stories.